We've done this a few times. With and without the gravy, it's good. I was hungry for this. But didnt have any biscuits or sausage dangit. 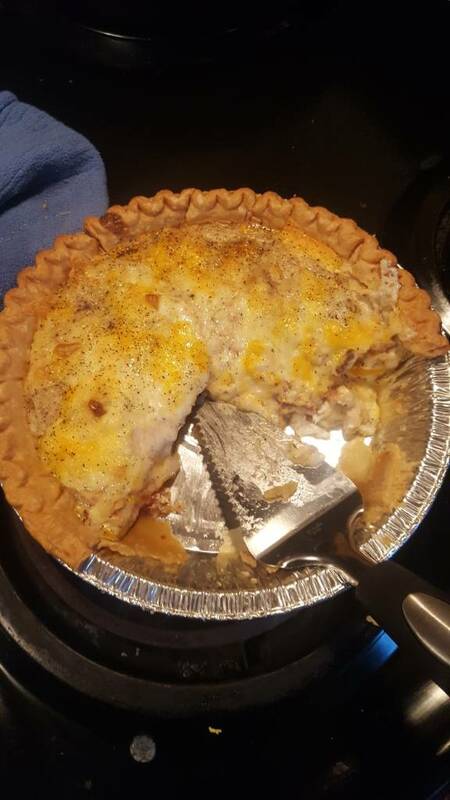 Used a frozen pie crust, bacon, 6 eggs, homemade gravy and topped with shredded cheese. Came out awesome for a throw together. Got it in the oven as we speak. Added some hash browns. Taking it to our Sunday School party this morning. It was a hit! I will definately be making it again! Finally tried it this morning. Pretty dang good and endless possibilities in the future! Made this last night and its dang good. Thanks for sharing. Making another one of these for Christmas morning. We did this today. It turned out great and the picky eaters had seconds! Comfort Food is Always Good. Mine is in the oven now. Just went with sausage egg biscuits cheese gravy and thick cut pepper bacon.